Looking to be a Fellow? Are you a mid-career museum professional looking to have a bigger impact on the field? Do you want to get engaged with VAM, and build your resume at the same time? 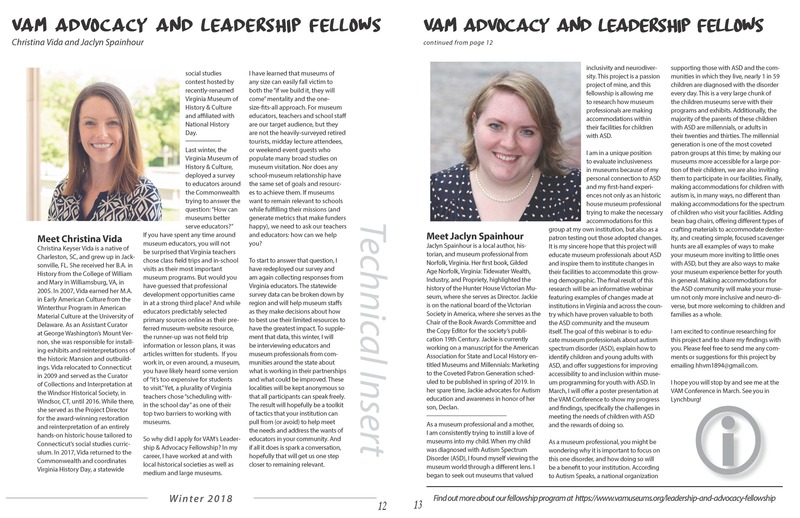 VAM’s Leadership and Advocacy Fellowship was created for exactly these reasons. If you are selected as a fellow, you would have the chance to do research, talk with your colleagues at other museums about challenges they face, participate in state and national advocacy efforts and conversations surrounding the future of museums. The end result of each fellowship will be a written report that will become a resource for your fellow museum professionals. This program is geared toward mid-career professionals, with between 6 and 20 years of experience in the museum field. All applicants must be members in good standing of VAM. 2018 APPLICATION DEADLINE HAS PASSED. Thank you to all of our applicants!